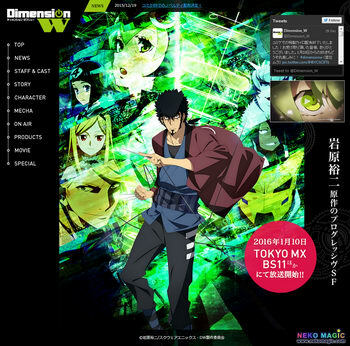 Komugi Yoshida is a somewhat clumsy middle-school student. She performs as an idol, but her only gigs are low-end ones like those at the local shopping district. One day, a mysterious injured creature named Usa-P appears before Komugi. She gives Usa-P medical treatment, and Usa-P, in consideration of Komugi’s kindness, asks if she wants to be a Legendary Girl who can use magical powers. Having become a reluctant Legendary Girl, Komugi battles strange masked figures who suddenly appear! Can Komugi handle the three roles of middle school girl, idol, and Magical Nurse? In Tetra Heaven, the land of legend, a hundred years of war had come to a close. The gods who lost the war searched for a new place to live, and found it in Septpia, the human world, which they proceeded to attack. The Logicalists attached to ALCA, a special police agency whose duty it was to protect cities from angel attacks, were compelled to act in defense of cities. 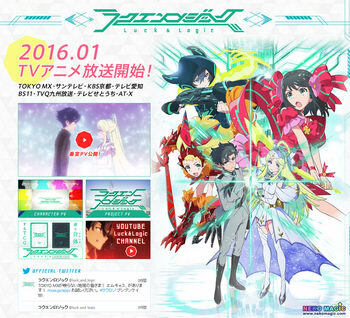 Yoshichika Tsurugi, who lacks “Logic”, was caught up in an attack, and meets a beautiful goddess named Athena. In her hands, she had the “Logic” that Yoshichika lacked. Now both Yoshichika and Athena head to their destiny. 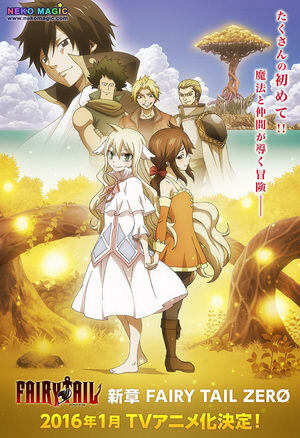 A prequel of the series Fairy Tail. 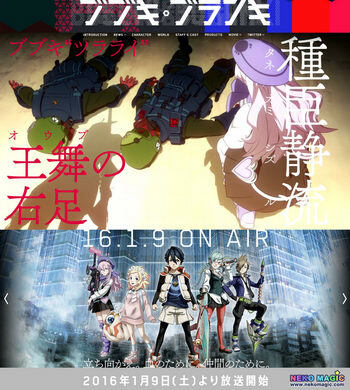 Koyomimonogatari includes twelve short stories about Koyomi from that destined Spring Break to the end of university exams. 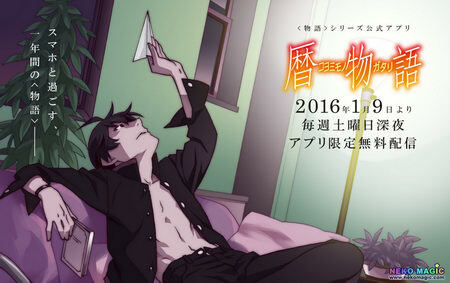 The series will debut on the upcoming Koyomimonogatari app on iOS and Android devices on January 9. 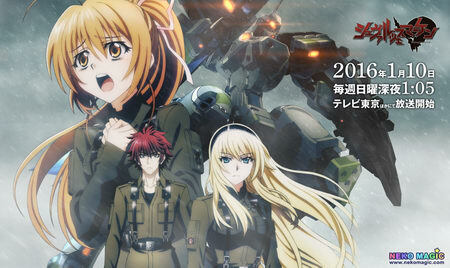 A spin-off of Muv-Luv Alternative, the novel’s story focuses on the 666th TSF Squadron in 1983, 18 years before the events of the earlier serialized novel Muv-Luv Alternative: Total Eclipse. 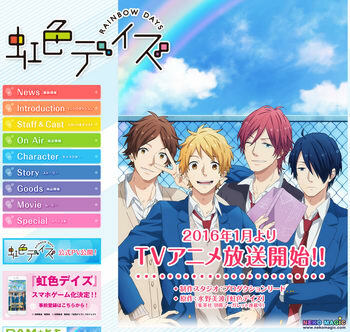 Nijiiro Days follows a group of four male high school students who are close friends: Natsuki, Tomoya, Keiichi, and Tsuyoshi. The four boys have no club activities, and they hurry through their studies so they can spend their days having fun. Their main topic of interest: love. Natsuki has an unrequited crush on Anna, a girl from another class, and his friends keep meddling in their relationship. When Haruhito awakens, he’s in the dark. He doesn’t know where he is, why is he here, and where he came from. Around him there are several men and women who have the same circumstances. 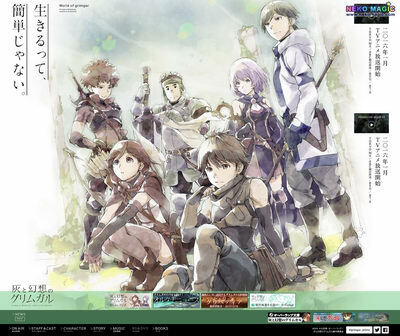 Haruhito and his companions find themselves in a “game-like world” called Grimgar and must form a party, cooperate, and learn new skills to survive the harsh environment together. 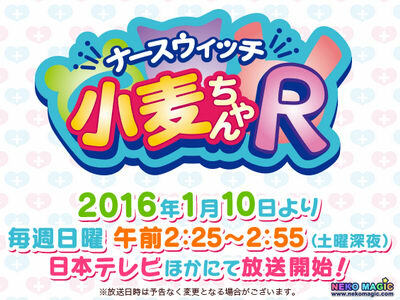 Seventh season of the Teekyuu series. The four girls of the Kameido High School tennis club play and don’t play tennis in their side-splittingly funny daily lives. The new club member, Yuri Oshimoto, is forced to be the straightman to her idiotic upperclassmen. Then there’s Kanae Shinjou, the stupidity-machine who can’t play tennis even though she’s in the tennis club; Marimo Bandou, the unpredictable super-pervert from Kansai; and Nasuno Takamiya, the air-headed, mysterious rich girl who tries to solve everything with money. Today, tomorrow, and the day after, regardless if they’re all there or not, it’s a tennis manga you can’t help but roar in laughter at?! 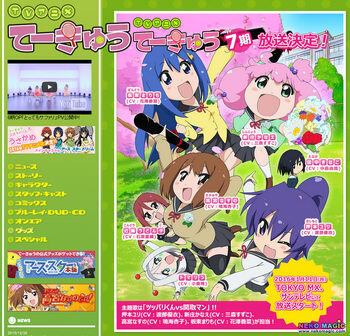 And in the fall of 2012, you might get caught up in the “Teekyuu” whirlwind even further? !